I’ve seen most of Jack Nicholson’s movies and I think it’s safe to say that in a goodly number of them he acts…well, nuts. Even when he plays a supposedly sane and normal guy he throws in enough personality quirks and upraised eyebrows that no matter how normal the character is supposed to be he still seems a bit off. And if that wasn’t enough, there’s always that weird look in his eyes that makes watching Jack Nicholson so much fun. Marlon Brando is equally enjoyable to watch as an actor. But when he decides to go completely off the rails as he does in THE MISSOURI BREAKS the results are nothing less that spellbinding. Marlon Brando gives a performance that is at once delightfully hilarious and darkly frightening. If anybody had told me there was a movie where Jack Nicholson plays the most normal and balanced character I’d have bet money against it. But it’s true. In THE MISSOURI BREAKS Jack Nicholson plays a cattle rustler and horse thief who is probably the most honest and honorable character in the movie. Tom Logan (Jack Nicholson) and his gang of rustlers (Harry Dean Stanton, Randy Quaid, Frederic Forrest and John P. Ryan) are making a pretty good living stealing horses and cattle from David Braxton (John McLiam) an enormously wealthy and powerful landowner. Logan has an ingenious scheme going: he’s actually running a ranch on Braxton’s land that he purchased with money from a train robbery. Pretending to be a legitimate rancher is a nice cover for Logan’s other activities. Among them romancing Braxton’s outspoken, independently minded daughter Jane (Kathleen Lloyd). Things start to go sour when Braxton hires Robert E. Lee Clayton (Marlon Brando) a regulator whose manhunting skills are undisputed and whose talent for killing is legendary. What isn’t in dispute is his sanity. Clayton’s as mad as a Kansas City pimp. Insane though he may be, Clayton lives up to his fearsome reputation by ruthlessly hunting down and killing Logan’s gang one by one, ambushing them when they least expect it. Even Braxton isn’t safe when it becomes apparent that he can’t put the genie back in the bottle, as Clayton seems to have designs on Braxton himself. Logan is soon faced with a difficult choice: he’s grown to really enjoy working on the ranch and has even flirted with the idea of giving up his trade and settling down with Jane. But Clayton makes it plain that he’s not going to satisfied until all the thieves are dead and that includes Logan. While I was watching THE MISSOURI BREAKS I was reminded of another classic film that starred two other icons of American film: Robert DeNiro and Al Pacino, the movie “Heat”. And like that movie, Brando and Nicholson don’t share a lot of screen time together. So don’t be disappointed that you don’t get a chance to see them really matching acting chops. Instead just sit back and watch Marlon Brando go totally nuts with his role as Clayton. There’s a terrific scene where he snatches a corpse out of a casket to make a philosophical point about showing mercy to thieves. He shows up in every scene wearing a different bizarre outfit. In one scene he’s garbed as a pre-Civil War southern gentleman. 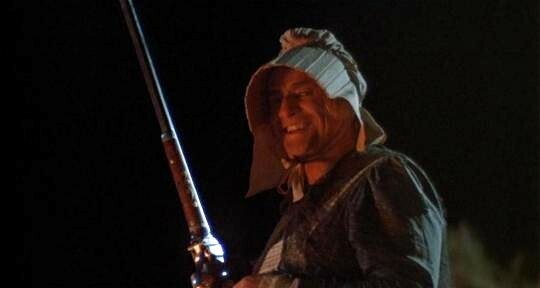 In another he wears a dress, apron and a bonnet while burning down a cabin to flush out of the rustlers. He speaks in weird dialects and unusual speech patterns that leave everybody around him utterly baffled as to what the hell he’s talking about. In comparison, Jack Nicholson is the very model of restrained acting. Next to Brando he’s almost sedate. He’s got a lot of good scenes with Harry Dean Stanton where they simply sit and talk about their lives before they became thieves and how they got to where they are now. He also has good chemistry with Kathleen Lloyd, who most people will recognize from her reoccurring role on “Magnum P.I.” as Assistant District Attorney Carol Baldwin. She’s mostly a television actress and I get the feeling from the reading I did before writing this review that THE MISSOURI BREAKS was her shot at feature films. A shot that didn’t hit the mark. I find her a wonderfully talented actress. Part of that may be her delightfully uncanny resemblance to Sarah Silverman in this movie. If you guys know me then you know how I feel about Sarah Silverman so ’nuff said. Randy Quaid plays the big, loveable dumb lug he’s played in numerous other movies while Frederick Forrest has one of the most undignified death scenes I’ve ever seen in a Western movie. This isn’t your traditional western where men face each other down in the middle of Main Street at high noon. In fact, the number of men who are killed due to sneaky tactics is alarmingly high. Nobody’s interested in having a fair gunfight. They’re more interested in staying alive and if that means bushwhacking a man by shooting him in the back, well, nobody loses much sleep over it. Men are hanged almost as a regular Sunday afternoon activity complete with beer and dancing. 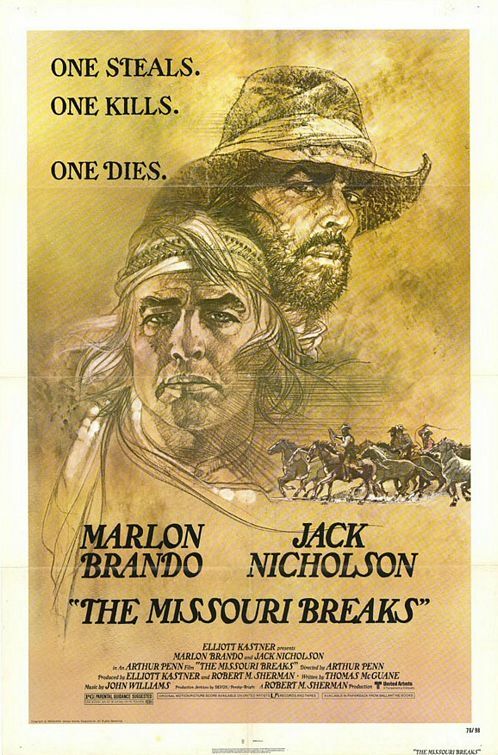 You’re not going to see a lot of traditional stuff you see in other westerns but you will see some terrific acting from Jack Nicholson and Marlon Brando, who totally walks off with the movie. Harry Dean Stanton provides reliable backup, as always and the rest of the cast are no slouches either. THE MISSOURI BREAKS is far from a conventional western and I wouldn’t have it any other way. It’s a good way to spend two hours. Enjoy with my blessings.